The cotton plant is by nature a perennial, but is grown as an annual because commercial crops must be turned under each year shortly after harvest to prevent diseases and to help combat the boll weevil. The flower on the plant (1) is very beautiful and is in the hibiscus family. 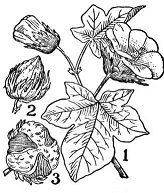 Thus the cotton plant is a nice summer green plant that will flower in late summer and then the cotton "square" (2) appears and finally the boll(3) which takes about a month to develop and bursts open with a white cloud of cotton fiber. to germinate. Cotton plants like a lot of sunshine and sufficient moisture to wet the roots thoroughly and then allowed to dry. They like occasional fertilizer or to be planted in fairly rich sandy soil. The seeds take from 4 to 15 days to germinate. The beautiful green plant will grow to 3 to 4 feet tall in about 35 -45 day before the first blossoms appear. The flowers will open by midmorning and will drop off in 2 to 3 days. Blossoming will continue 20 to 30 days. Turning into a boll, the seeds and fiber form within the boll and after about 20 to 35 day it will burst open into a fluffy white cotton ball. Would you like to see the progress of this amazing plant in your own home? Plant seeds indoors in 3" peat pots. Keep in a warm, sunny place, turning the pot a little each day. Best to start your plants indoors about 4 weeks prior to putting them outside. Transplant directly into the ground or a large outdoor pot when all danger of frost is over. To transplant, tear off the bottom of the peat pot. Water the plant well for the first few days. Keep in a sunny spot and away from a lot of wind. Make sure the ground is warmed above 60 degrees and put in well tilled loose sandy loamed soil. " I like to plant cotton into a large pot so I can move it indoors during the winter and put the plant out again next spring. It will last several years if it does not get frost bitten.